Musubi is located near the corner of SE 22nd and Division in Portland, Oregon. 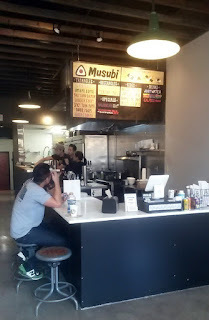 This spot just opened October 3, next to Bar Avignon. 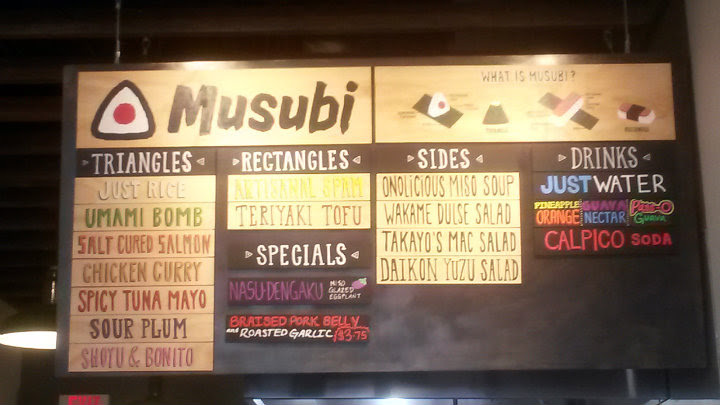 I like that it's a simple menu, focusing on various rice balls and sides. 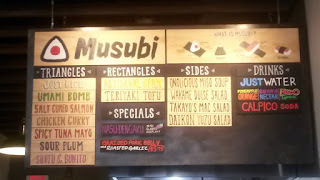 They may also have occasional special musubi options. 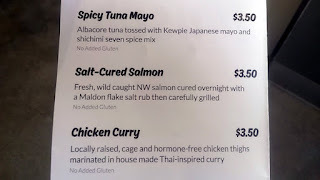 Going in late last month, most of the patrons were Asian, probably slightly younger than me. There are only five seats in this location, and most people elect to take their food to go. I tried a couple for science. It appears they craft everything to order. The owner generally says 2-3 musubi should be enough for a meal for a bunch of people. The Chicken Curry Musubi ($3.50) is in triangular shape. 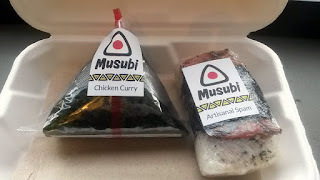 Pull down the red tab and tear the wrapping open carefully to keep the nori in one piece. 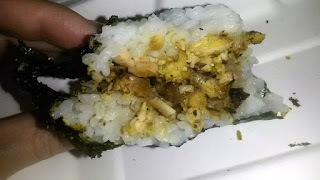 It's intentionally wrapped to keep the nori separate from the rice ball itself, so you'll have crispy seaweed when you want to eat this. 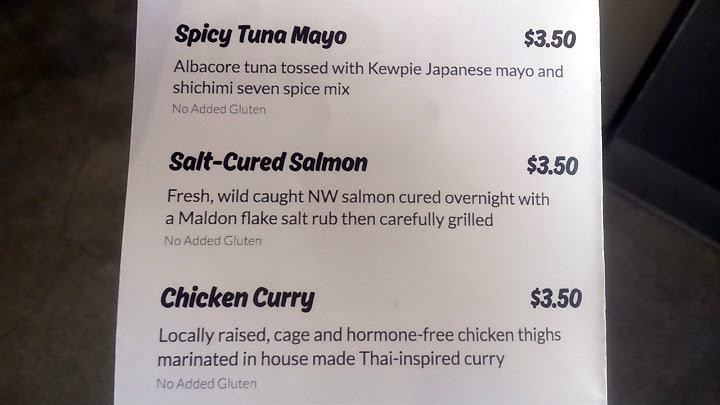 The rice itself is lukewarm. 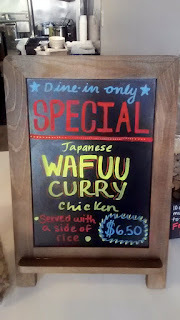 The curry one was good overall, although I wanted more chicken curry here. Makes me wonder if they could serve a curry sauce with this just to inject more flavor. 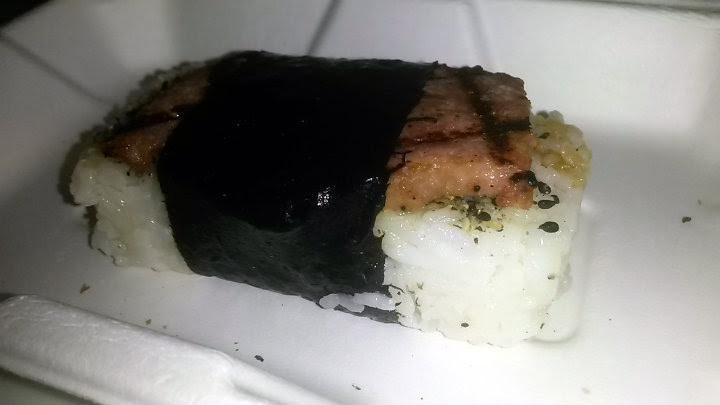 Naturally, the Artisanal Spam Musubi ($3.75) was next. 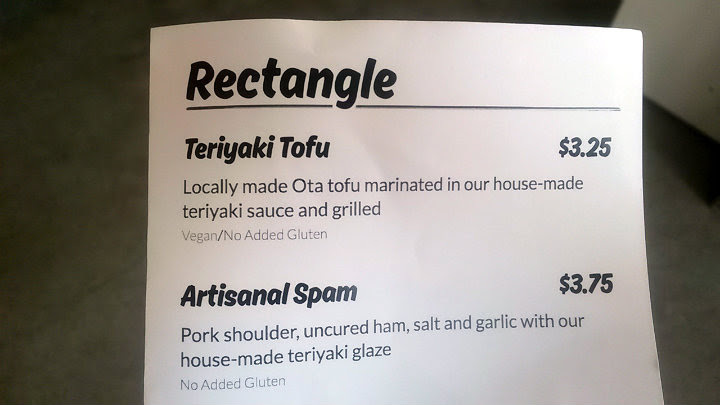 Rectangular-shaped, of course. 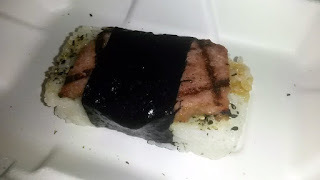 The spam here is made with pork shoulder and uncured ham. House-made teriyaki glaze made this one a nice treat. I'd call this one another success. Frankly, if you have a rice cooker and a spam musubi maker (yes, they exist), you can make pretty much anything they do here without too much trouble. However, I'm also a lazy panda, so I usually opt to have others do the hard work for me. 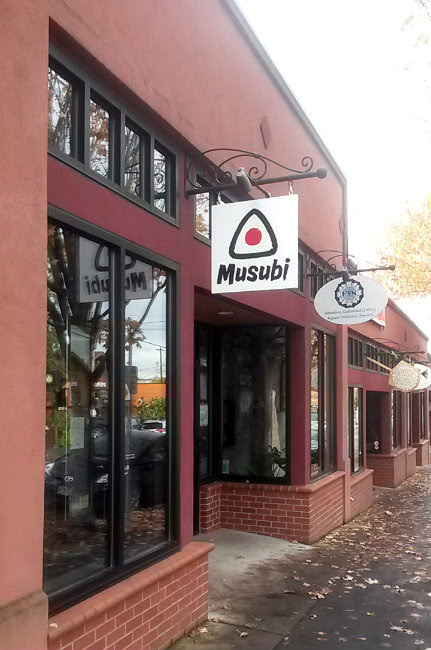 Due to the small location, Musubi will likely focus more on takeout and delivery. Since the order took a few minutes, I wonder how they will respond should they really get popular.